1. The Tuxedo: "I went with the classic black with peak lapels, and to keep it on the traditional side jetted pockets and a single button. To modernize the fit and make it more comfortable, I went with an unstructured shoulder and dual back vents. 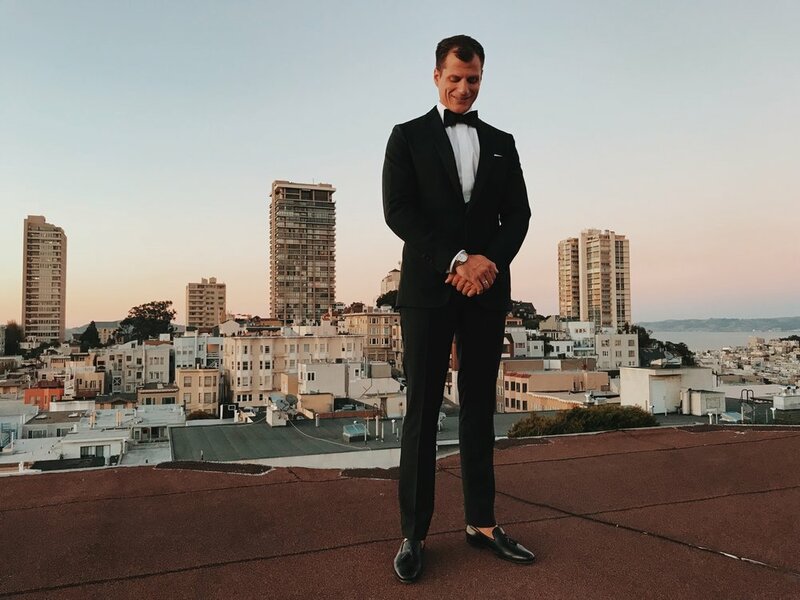 While midnight navy shawl collar tuxedos are our most popular design among clients, it's nice to always to return to a timeless dinner jacket." 2. The Tuxedo shirt: "You don't have to wear shirt studs with your tuxedo. I prefer a "fly" front placket that covers thin mother-of-pearl buttons for a very clean and streamlined look. And I skipped the pleated front on the shirt, too, which I think looks a bit "disco." Obviously, I kept the French double-cuff as this is a formal shirt and a semi-spread collar, which I find frames my face best." 3. The Bow tie: "I always match my bow tie to my lapels on tuxedos, so it's in the same black silk satin." 4. The Shoes: "Our Hall Madden Signature Black Captoe Oxfords are a perfect option if you want something more versatile, as you can wear them with suits, too. But I really liked these formal loafers that have tassels and a bit of personality to them! Black tie doesn't allow you to make too many "statements," but sometimes it can be fun to bend the rules a bit." 5. Cuff Links & Pocket Squares: "The pocket square is a simple, TV-folded white handkerchief. My cufflinks are from my father -- jewelry is always more special when received as a gift." Be black tie ready with our exclusive formal package. Our in-house specialty Vitale Barberis Canonico Fabric, a custom Thomas Mason cloth bespoke tuxedo shirt, bow tie and shoes for a special promotional price available with the link below.